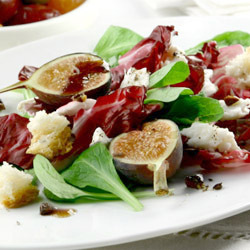 Transport yourself to a villa on the Mediterranean with this salad of figs and olives. In a small bowl wisk together olive oil, vinegar and honey. Season with salt and pepper. In a large bowl toss radicchio and frisee then arrange on individual plates. Top with figs, bread and torn pieces of cheese and bread. Sprinkle with the chopped olives. Drizzle with dressing. If you can’t find fresh figs your can substitute dried figs or even grapes.